On Thursday, May 4, 2017 Northside Toyota proudly presented a recognition certificate and cheque for $1800.00 to St. Mary’s College as part of the Toyota Evergreen Learning Grounds Program. This is Toyota’s 16th year offering this program. Since 2000, the Toyota Evergreen Learning Grounds Program and its Dealers have distributed over $11 million to this program. Evergreen, Toyota Canada Inc. and its Dealerships are working together to improve the health and well-being of future generations by educating children about the importance of restoring and preserving the environment. Toyota Dealers are actively involved in this program, with 85% of Dealers across Canada matched to grant-awarded schools in their market area. Since its inception, this program has helped green the grounds of over 3,000 schools, providing outdoor learning opportunities to over 1.4 million Canadian students. 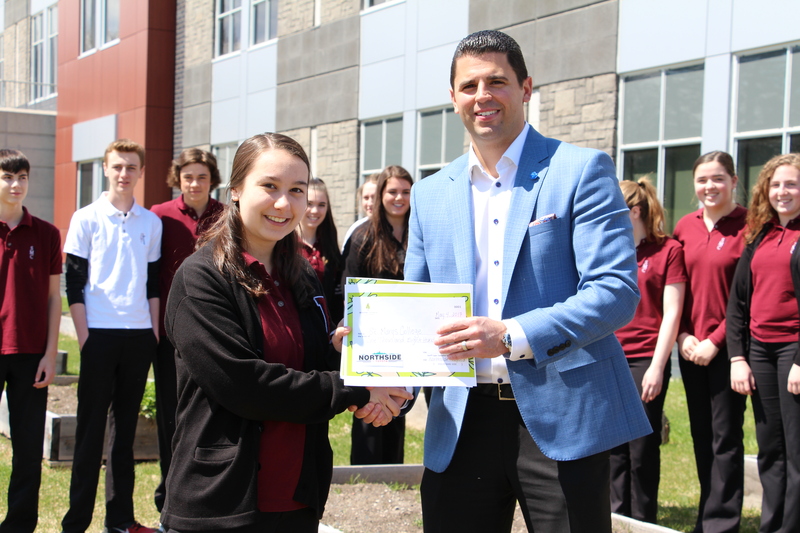 St. Mary’s College students accepted the grant from Mario Palumbo (Dealer Principal-Northside Toyota) which will help fund their volunteer initiated garden. The idea for the school garden sprouted to meet curriculum for Advanced Placement Biology students while at the same time nurturing an environment of sustainability and giving. Together with community partners including Lemieux Composting and Clean North, the woodworking students of SMC built 10 raised garden beds to plant vegetables, herbs and fruit. The students from the Grade 10 and 11 Advanced Placement Biology classes worked diligently to plant, weed, and harvest throughout the school year and through the summer. All produce from the garden throughout the summer was hand delivered to the Community Soup Kitchen and St. Vincente de Paul by students, teachers and other volunteers. It is been a rewarding learning experience for the students and the hope is that the project will continue to grow over the next few years. The grant from Toyota was given to add a pergola for some much needed shade to the garden area, as well as some benches and seating for students to hopefully enjoy spending their time in an outdoor green space. The students of SMC are extremely grateful, excited and ready to get planting!